An add-on pass simply means you are adding an extra part onto your New Zealand bus adventure. 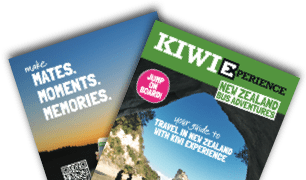 The Kiwi Experience flexible travel network is made up of two base passes, the Funky Chicken – our start anywhere, unlimited travel base pass, and the Sheepdog – our start Auckland finish Christchurch base pass. Every other pass is made up from either one of these two base passes + add-on passes. If you want to visit Milford Sound, simply add a Milford Explorer add-on pass to a Funky Chicken and you have yourself a Hokey Pokey pass! Pick and choose from our list of epic add-on passes to make sure you get off the beaten track and experience the real New Zealand. Customizing your New Zealand bus adventure has never been easier! The Deep South is a journey into the deep south of New Zealand. The beauty of Milford Sound is well known but it’s the other stops that make this pass well and truly off the beaten track. You’ll start by travelling to the legendary university city of Dunedin with its active nightlife. From there, the bus heads to Invercargill, the world's southernmost city, which is the gateway to many more hidden secrets. If you get the chance to go to Stewart Island - take it!